Long-Time Minister of the Gospel, Andrew Milton “Andy” Brown, born March 10, 1926, in Maury County, TN, died January 22, 2019, at Elmcroft of Brentwood in Nashville, TN. Son of the late William Elgin and Lottie Hardison Brown. Also preceded in death by two brothers, Marion R. Brown and William E. Brown, Jr.; and by two sisters, Dorothy Johnson and Irene Jones. Survived by sister, Jean Parrish and her children, Tony Parrish, Jennifer Montgomery, and Jason Parrish; and by several other nephews and nieces. 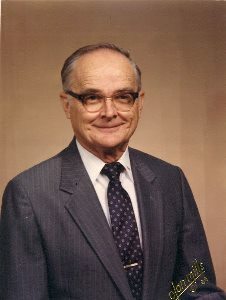 He was a retired Church of Christ Minister, a graduate of David Lipscomb College, now Lipscomb University, and George Peabody College for Teachers. He spent two years in Starkville, MS, four years in White Bluff, TN, ten years in Pulaski, TN, and twenty-five years in Lawrenceburg, TN. He retired at age 62 and moved to Nashville, TN. He was a frequent writer of letters “To the Editor” and was a familiar face at the Tennessean’s Forum Banquet for three star letter writers. He lived near TravelCenters of America, formerly Truck Stops of America, and drank coffee two or three times daily with drivers from across the country. Truckers were some of his best friends. For most of his life he was a big baseball fan. He spent thirty-six spring training vacations in Florida. He enjoyed bowling and often spoke of bowling in a National Senior Men’s Championship at Niagara Falls, NY. He loved the farm and for several years owned the farms on Bear Creek Pike east of Columbia, TN that his parents had owned. In 1959 he bought the Bob and Ida Kimbrough farm on Weakley Creek in Lawrence County, TN. The 321 acres were a bit of Heaven on earth for him until his death. Arrangements are being handled by Neal Funeral Home, 231 N. Military Avenue, Lawrenceburg, Tennessee. The family will receive friends from 12:00 PM to 8:00 PM Friday, January 25, 2019 at Neal Funeral Home. Funeral services will be conducted at Neal Funeral Home at 11:00 AM Saturday, January 26, 2019, with John Vaughan officiating. Graveside Committal will follow at 3:00 PM at Jones Cemetery in Maury County, TN.